A little more than one hundred years ago, Philadelphia, through the pages of the Philadelphia Inquirer, was at the center of a debate that would draw opinion from across the American soccer scene. At issue was not the relevance of the game in the American sport landscape but the rules of the game itself. For the Inquirer, at the heart of the penalty kick issue was the question of fairness. 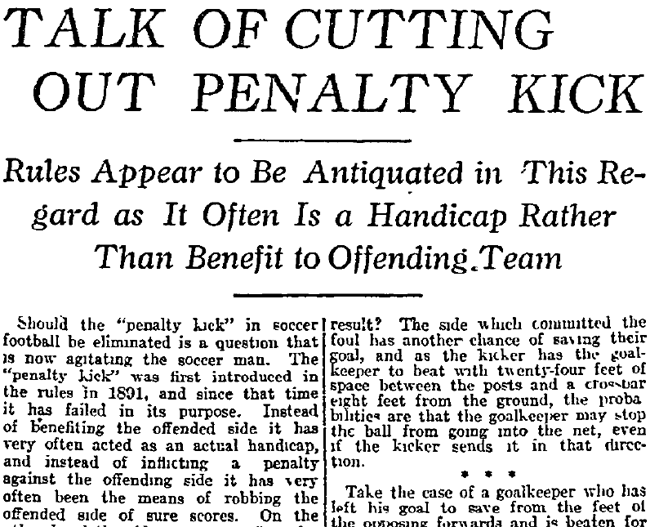 Describing the “meager chances” of converting a penalty kick, the Inquirer observed, “It has been estimated that not more than fifty goals are kicked from one hundred ‘penalty kicks. '” As incredible as this may seem to readers today, it is important to remember the conditions in which the game was played one hundred years ago: Fields were unlikely to have the pool table flatness we are accustomed to seeing and were very likely to be chopped up by the heavy studded boots worn by players. Those players were kicking a bladder-filled laced leather ball that lost any perfect roundness that it might have possessed almost as quickly as it grew in weight from absorbing moisture and mud. The Inquirer continued to publish series of letters on the debate. Local soccer luminaries such as John B. Farrell, president of the city’s Allied American Football Association, and Benjamin Groves, president of the city’s professional Pennsylvania League, continued to weigh in on the topic. But views from some of the eminent names of the wider American soccer landscape also continued to be heard. Andrew M. Brown, president of the AFA, Charles C. Pickford, president of the New York Footballers Protective Association, and Ed Waldron, president of the Referees Association, favored retaining the penalty kick rule as is, as did Dr. A. Murray, president of the St. Louis Soccer Football League. 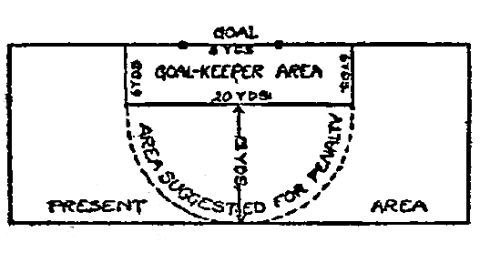 Lone’s proposal to redefine the penalty kick area. From the January 12, 1913 edition of the Philadelphia Inquirer. The Inquirer noted that the progressives were not of one mind, with suggestions ranging from abolishing of the rule altogether, to modifications of where a penalty kick should be taken from, to modifications of the penalty area itself. But, the Inquirer warned, as the game grew here, America would soon gain the experience to play the game according to its own rules. Whether motivated by a more neutral impulse to improve the game or by more arrogant and/or misguided efforts to “Americanize” the sport in order to make it more “attractive” to an American audience, American soccer would continue to be littered with attempts at rule innovations. Some of these rule changes persist, notably at the college level. But with the ongoing growth of soccer has come the understanding that the base of soccer fans wants the game to be played according to the rules followed by international soccer. Now, the American impulse toward innovation is reflected by what is perhaps a more realistic understanding of US soccer’s place in the world’s game and is expressed by a willingness to adopt innovations such as goal-line technology rather than through implementing new rules or advocating for the elimination of long-standing rules. A version of this article first appeared at the Philly Soccer Page on January 9, 2013. Great stuff. I always enjoy anything that runs counter to the idea that Americans only started taking an interest in soccer about 20 years ago.